Feb 9 at the Long Branch Free Public Library in Long Branch at 11 AM, organized by Our Revolution Monmouth. Please RSVP here. The event flyer is here. Feb 13 at the Rutgers Labor Education Center in New Brunswick at 5:30 PM, organized by NJUHC. Please RSVP here. The event flyer is here. Feb 13 at The Big Event Entertainment Experience in Cherry Hill at 6 PM. Janice Ortega, a member of South Jersey Women for Progressive Change, is hosting this event. Please RSVP to Janice at jorteg08@yahoo.com to participate. The event flyer is here. Feb 14 at the Bridgewater Public Library in Bridgewater at 7 PM, organized by Our Revolution Somerset County. Please RSVP here. Information on the barnstorms are on our website. The closest barnstorm near you can be found on the map at medicare4all.org. 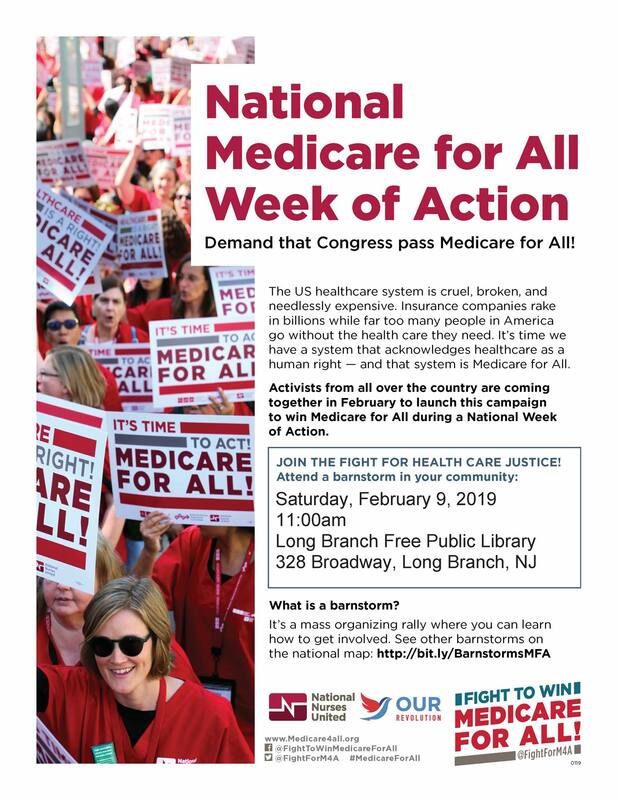 In addition, Our Revolution Essex County will host a Medicare for All forum on Feb 10 at The First Congregational Church in Montclair from 2-4 PM. 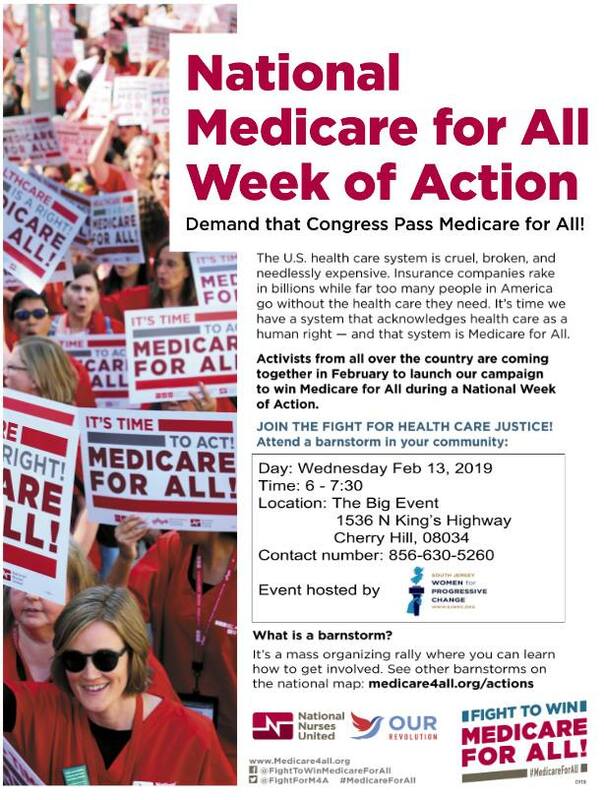 Keynote speakers include Safiyyah Muhammad, who will share a personal story; Lloyd Alterman, MD, member of Physicians for a National Healthcare Plan; and Mark Dudzic, National Coordinator for Labor Campaign for Single Payer. Safiyyah and Lloyd are NJUHC members. 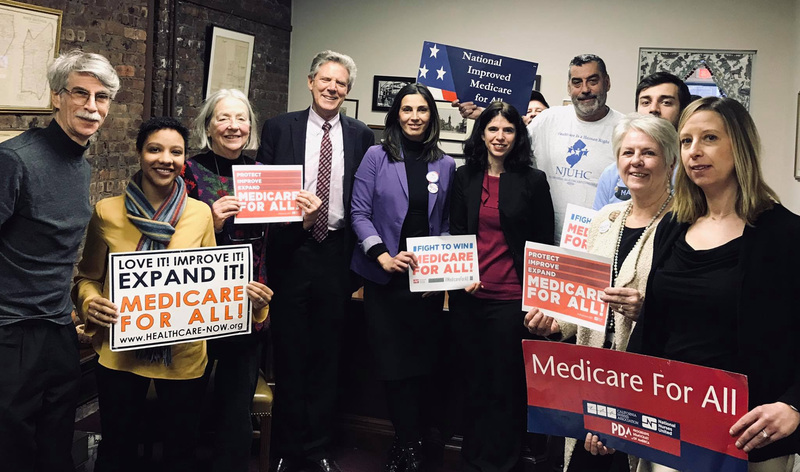 A delegation of labor unions and grassroots organizations met with Frank Pallone in New Brunswick on Jan 31 to pressure him to sign onto Medicare for All legislation. As the incoming chair of the Energy & Commerce committee, Pallone can decide what legislation advances the committee. Pallone expressed support for Medicare for All at the meeting but did not commit to any such legislation. He promised to hold hearings on various healthcare proposals including Medicare for All. The delegation delivered a stack of signatures to him from constituents who want single payer. A phonebank to invite people to NJ barnstorms followed the meeting. NJToday.net covered the meeting before it took place. He has previously campaigned on being a Progressive and a “big single payer advocate,” and he criticized Senator Corey Booker for not advancing Progressive legislation, even though Booker is one of the original co-sponsors of the Medicare for All Act of 2017. Copyright © 2015 NJ Universal Healthcare Coalition, All rights reserved. Purchase an NJUHC T-shirt and help the cause!